With the wide variety of dog food brands available, it can be a challenge to choose the type that is best for your dog. Luckily, the task is easier than it appears. When selecting a brand plan on staying with it for a long time. Changing brands could result in digestive issues for your dog. If you do switch, do so gradually by mixing the old food together with the new food over several weeks. Add more and more of the new food as time goes on. If you see any problems emerge such as skin irritation or changes in the feces, stop the switch. All foods are regulated by the U.S. Food and Drug Administration and must include ingredient's that are generally recognized as safe (called GRAS). The expiration date for canine dog food can be found on the bottom of the product/bag or near the UPC code Most canine food expiration dates are 1 year after the food has been manufactured. Dog and Puppy foods are required to be nutritionally complete at the expiration date. After that date vitamins such as B and C may breakdown. Check the Certification: Since dogs eat the same food every day, nutritionists have been able to determine with a high degree of accuracy that exact levels of specific food components. Dog goods that meet the AAFCO (American Feed Control Officials) standard meet these exacting standards for components such as protein (plant of animal), fatty acids, minerals and vitamins. Make sure that the AAFCO certification states that the food provides "safe and balanced nutrition." This also ensures that the dog food is safe and meets the standards of the U.S. Food and Drug Administration. Sample Dog Food Label lists ingredients in order of percentage found in the product. Note AAFCO statement in lower right corner. All ingredients must be listed in order, from greatest percentage to least. 95% Standard: This means that if a package says beef or Chicken in the headline, the named ingredient must be 95% of the product if the water used for processing isn't counted. If there are two ingredients on the headline, such as Chicken and Liver, each together must comprise 95%. 25%"Dinner" Standard (words that also mean dinner include Platter, entree, nuggets and formula): If the word "dinner" is in the headline, then this means that the food is 25% of all ingredients. For example a "Chicken Dinner for Dogs" must be 25% chicken. 3% "with" Rule: This is an important rule to know. If a label says "made with chicken" the product must contain only 3% of that ingredient. If the label says "Chicken Dog Food" it must contain 95% chicken. Flavor Rule: If a label says flavored, such as "Chicken Flavored Dog Food" the taste of chicken must be present. The food does not have to contain actual chicken, since artificial ingredients can be used as a substitute. Caution: Check the Association of American Feed Control (AAFCO) statement before you purchase any canine food. If it states that the dog food is an “all life stage” product, then it contains high levels of nutrients designed to support the growth of puppies, and could result in excess nutrients that may be detrimental to an adult or mature adult dogs’s health. Food Components: Check the label to determine the source of components such as protein. For example, better dog diets are comprised of protein from meat sources vs. plants. Meat byproduct meal = ground and rendered meat and other animal parts (organs, feet, chicken heads). By-products: Some manufacturers will use cheaper animal by-products such as intestines, necks or feet. Dyes: Artificial coloring is used in some dog foods. Preference: Veterinarians will recommend diets that address specific dog health issues such as canine food allergy, skin problems, arthritis or digestive tract issues. Other options such as organic dog foods, source of protein (animal, plant), and other ingredients are up to the preference of the owner. Our general guideline is to recommend that you feed your dog to the standard that you feed your family. Generic terms such as beef or chicken do not tell you the part of the animal used, or the freshness of ingredients selected. Less reputable manufacturers may also shift quality from batch to batch based on the price of food components. Because of this, it is important to pick a canine food manufacturer that you trust. If your dog is healthy, then the "best" canine food would be the one that you could find at the lowest cost that is labeled "complete & balanced," "total nutrition" or "100% nutritious." canine foods can vary in price with WalMart charging 34 cents for their Ol' Roy brand vs. $2.22 a pound for a Premium supermarket brand. The average consumer spends $36/month for canine food. 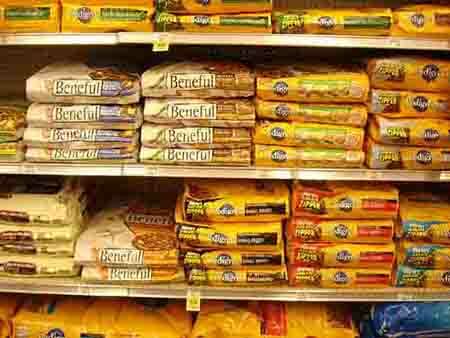 Consumer Reports secret shoppers found the cheapest dog food prices at Target and Walmart. Private label canine dog foods found at Costco (Kirkland) are also fine. 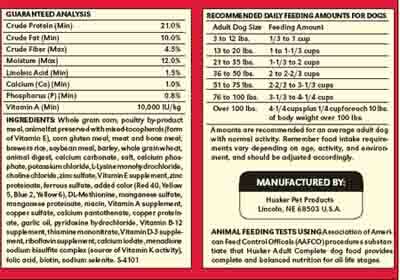 Your veterinarian and the dog food label should indicate the recommended feeding frequency. In general, puppies should eat 2x to 3x per day. After 6 months of age, dogs should eat 1x to 2x per day. Feeding with greater frequency per day (not total quantity) will help the dogs gastrointestinal system and will facilitate digestion. In adult dogs you should be able to feel your dog's ribs and the abdomen taper from the front of the rear legs down. In other words you should be able to see a waistline. A veterinarian can calculate a condition score for you. To determine the right amount of food for your dog, start by using an 8-oz measuring cup to measure one cup of dog food. This way you can control exactly how many cups you provide each day, Note that providing your dog the amount suggested on the dog food label may be more than your dog needs since the exact amount depends on the amount of exercise your dog gets. Convert from kilograms to pounds by dividing your dogs weight in pounds by 2.2. 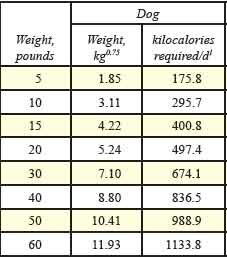 This is the amount of calories your dog should consumer each day. Next divide the number of kilo calories per cup found in yoru dog food into the number you determine in step 2. This will tell you how many cups of dog food per day to feed your dog. Example: If the canine dog food you purchase has 347 kilo calories per cup and your dog weights 10 pounds, teh dog would need to consumer about 4/5 of a cup (.8) per day (295.7 kilo calories per day divided by 374 kilo calories per cup equals .79 cups per day).